New Delhi, India – His Holiness the Dalai Lama drove in wintry sunshine this morning to the extensive campus of Jawaharlal Nehru University (JNU) to attend the inaugural session of an inter-religious conference. The meeting took place at the initiative of the Qutbi Jubilee Scholarship Program and the Centre of Arabic and African Studies of JNU. Syedna Taher Fakhruddin Saheb welcomed His Holiness on arrival and escorted him into the University premises. Once His Holiness and other eminent spiritual leaders had settled on the stage, the Vice Chancellor of JNU, Prof Jagadesh Kumar gave a short welcome introduction. He stressed the importance of nurturing inner peace, suggesting that only when we have peace of mind within us will we properly appreciate harmony in the world around us. Prof Tahera Qutbuddin, in her introduction as Co-Director of the Qutbi Jubilee Scholarship Program, explained that the present meeting was part of a Taqreeb Conference Series that began in Kolkata. She clarified that ‘taqreeb’ means to bring closer. She remarked that the Prophet Muhammad, the Buddha and many other religious teachers highlighted the importance of kindness and education in the spread of harmony. Syedna Taher Fakhruddin Saheb welcomed everyone present as members of one family, for, he said, that was the spirit in which the conference was taking place. As to why such meetings were being convened, he pointed out that, at the present time violence is rife. “Since people regularly enter into dialogue after conflict has taken place, how much better it would be if they were to talk to each other in the first place. All religions teach that people should believe of their own free will, with no force involved.” He explained his father’s role in bringing people together, to act in the interest of the greater good. Jain leader, Acharya Lokesh Muni, spoke about peace and harmony in Hindi. He was followed by Shri Gaurgopal Das who stated that all our different religious traditions share a message of peace and harmony. He illustrated the need for work to improve harmonious co-existence with a story about the willingness of pigeons to share their living space wherever they were—on the roof of a temple, mosque or church because they were just pigeons. A young pigeon was bewildered that the people who used these buildings seemed less generous and more concerned with being Hindus, Muslims or Christians than just fellow human beings. Shri Gaurgopal Das pointed out that those who experience God experience harmony because they recognise the whole world as their family and everyone in it as brothers and sisters. Rabbi Ezekiel Isaac Malekar declared that he was an Indian first and a Jew second because India is the only country in which Jews have not been discriminated against. He suggested that concern for humanity is the only real religion and that ahimsa would be better translated as ‘love’. Sadar Manjit Singh said that every religion preaches equality and love for each other. He cited the Sikh founder, Guru Nanak’s efforts to convey respect by engaging in dialogue and visiting others’ places of worship. He informed the gathering of his community’s efforts to serve displaced Rohingyas and to provide food and shelter to those who come to demonstrate at Jantar Mantar, near to Gurudwara Bangla Sahib. Dr Ali K Merchant speaking as a representative of the Bahá’í faith emphasized the need to recognise the oneness of humanity. Archbishop Anil Joseph Thomas Couto spoke of Jesus Christ’s having come to teach love, forgiveness and the way of service. He mentioned the example of Jesus’s washing the disciples’ feet and the parable of the good Samaritan, who acted out of a fundamental responsibility to help another human being. In such a way, he said, we need to join hands to build a better world. Justice Ahmadi, former Chief Justice of India, noted that people of all the world’s faiths are found living together in India. Expressing reluctance about the use of the word tolerance when it implies, “I don’t like you, but I’ll tolerate you”, he suggested that we need instead to actively embrace and accommodate each other. 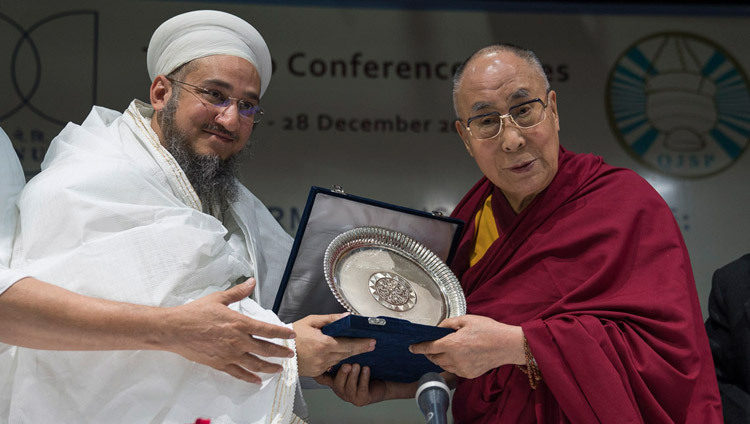 He was pleased to announce the award of the Syedna Qutbuddin Harmony Prize, in memory of the 53rd Da’i al-Mutlaq, Leader of the Dawoodi Bohra people, to His Holiness the Dalai Lama. then presented His Holiness, spiritual leader of the Tibetan people, and advocate of peaceful non-violent co-existence, with a plaque. “Respected brothers and sisters, it’s been a great honour for me to listen to these marvellous speakers,” His Holiness responded. “There isn’t much else for me to say. We human beings are wonderful in some ways, but act as trouble makers in others. Because we rely on violence and the use of force, we spend money and ingenuity on developing powerful, complex weapons. Despite talk about eliminating nuclear weapons, and the knowledge that if they were used they could destroy the world, no concrete steps have been taken. What will happen if we go on like this? “Our various religious traditions provide us with ways to tackle the destructive emotion that underpin our misuse of our intelligence. One way to reduce destructive emotions is to actively develop positive emotions like love, contentment, tolerance and forgiveness—all our religions talk about them. The question is whether we take our faith seriously or not. If I dress as a Buddhist monk, but there is no change in my mind, I have not much to show for my practice. “All religious traditions have the potential to produce warm-hearted people, but unless we are sincere, it’s all too easy for religion to be further grounds for thinking in terms of ‘us’ and ‘them’. “Scientists tell us of evidence that human nature is compassionate. They also observe that constant anger, fear and hatred undermine our immune system and so are bad for our health. This is why in addition to physical hygiene we need to cultivate emotional hygiene, a focus on achieving peace of mind. As social animals we need friends, but we don’t make friends through fear and anger. It’s by showing genuine concern for others’ well-being that we earn their trust and trust is the basis for friendship. Finally, His Holiness drew attention to the treasure that is India’s ancient knowledge of the workings of the mind and emotions. He suggested that this profound psychology is relevant today when tackling destructive emotions is so urgent. Learning to achieve peace of mind is the basis for establishing peace in the world, he said. And India is the one country that has the potential to combine its ancient knowledge with modern education for the wider benefit of the world at large. 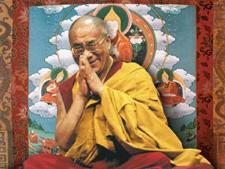 Tomorrow, His Holiness will travel to Sarnath, Varanasi.